Today's cake was a classic New York Style cheesecake. On top were some fresh glazed berries. The cake was creamy, consistent throughout with no added fillings and not especially heavy. It was quite good. The cake was accompanied by a discussion of whether it is more economical and efficient to fly a corpse to a neuropathologist for autopsy or to fly the neuropathologist to the corpse. Is was speculated that if the corpse could somehow take a seat like any other passenger then the point would be moot. How to accomplish that became a subsequent subject of humor with references to "Weekend at Bernie's". A following conversation wondered about where all the tuition money paid to a major university goes. Hmmm!! We wonder! Today's cake hour treat was a pair of flans, one plain and simple and another with coconut. Both were delicious and kudos to Vicky for her work. However, a mild controversy ensued when Vicky's recipe - of Puerto Rican origin - was sweeter than a similar flan from a Cuban recipe. It was decided that the issue would be settle by a Flan-off to take place next Wednesday! 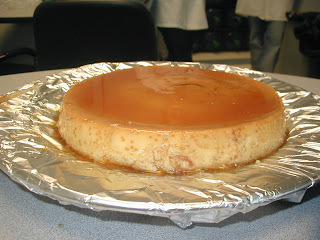 A Cuban, a Puerto Rican and a Hong Kong flan will be judged by the assembled group. The competition will be fierce! Welcome to Cake Hour Cackle! Welcome to the official Cake Hour blog of the Liver Research Center. Cake Hour is one of the most sacred rituals at the Liver Research Center. A devoted LRC member, who has successfully mastered the art of scheduling his/her experiments around Cake Hour, would soon discover that a thin slice of Black Forest Cake accompanied by a fresh cup of coffee and a lively discussion on arts, humanities and politics can be just as rewarding as, if not more than, a clean Western Blot or a strong PCR band. The purpose of this blog is to extend the spirit of Cake Hour beyond the physical boundary of 55 Claverick Street. Share a recipe, join a discussion, announce your latest scientific discoveries, or simply drop by to say hello. Any current and past members of the Liver Research Center are welcome to participate. You can even obtain your very own personalized author account by bringing in a good cake (or pie) during the next Cake Hour. We hope you enjoy this blog and let's have some cake! By the way, the cake is NOT a lie.